Located across from the Hemingway House, visit the Key West Lighthouse Museum and enjoy the best view of Key West from 85 feet high. Built in 1847 on one of the highest points in Key West, the Key West Lighthouse is the 15th oldest surviving lighthouse in the country. Although it has been decommissioned since 1969, the lighthouse tower and Keeper's Quarters have been faithfully restored to its original grandeur and is open to the public for tours. Visit the museum filled with artifacts of the 1900's and stories of the keepers that lived there. Climb the 88-step circular iron stairway to the top observation deck with sweeping views of Key West and the ocean. Watch the sun disappear as it sinks down into the Gulf. Can I climb to the top of the Key West Lighthouse? 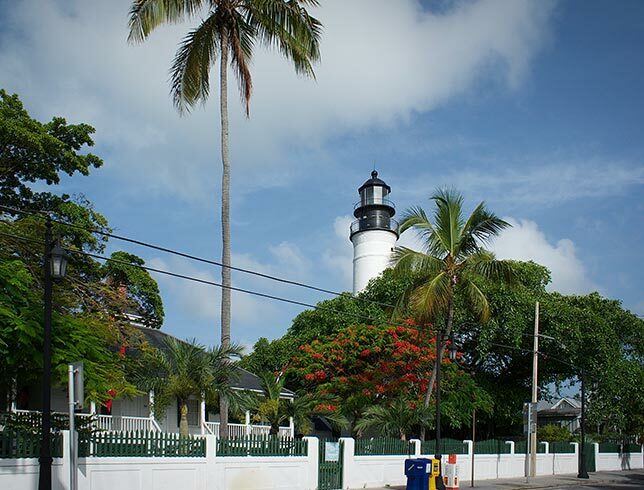 Visitors can climb the 88 steps to the very top of the Key West Lighthouse tower for a birds-eye-view of Key West. If the challenge is accepted, you’ll be rewarded with breathtaking views of Key West and the ocean, perfect for viewing a sunset. How can I take a Key West Lighthouse tour? Hop on the Old Town Trolley tram for a guided and narrated tour of all the best attractions in Key West. The Key West Lighthouse is the fifth stop on the loop and offers a tour of the lighthouse grounds to see the Keeper’s Quarters that have been restored to their original charm and filled with nautical artifacts, antiques, maps and vintage photos.